This piece is the compliment to this piece that I will be making prints of for the arts and crafts show. As of right now, I am pooped and I think I’m going to take a break. I’m going to do some very much-needed housework and read a good book. I’m not complaining, so far this has been a positive experience and it’s been good for me to have goals to meet…I just hope it ends as a positive experience. That would make a really cool set of note cards. I was thinking of you today. I went to the Picasso exhibit and was wishing you were there. I think you would really enjoy it! This is so cool, Carol. 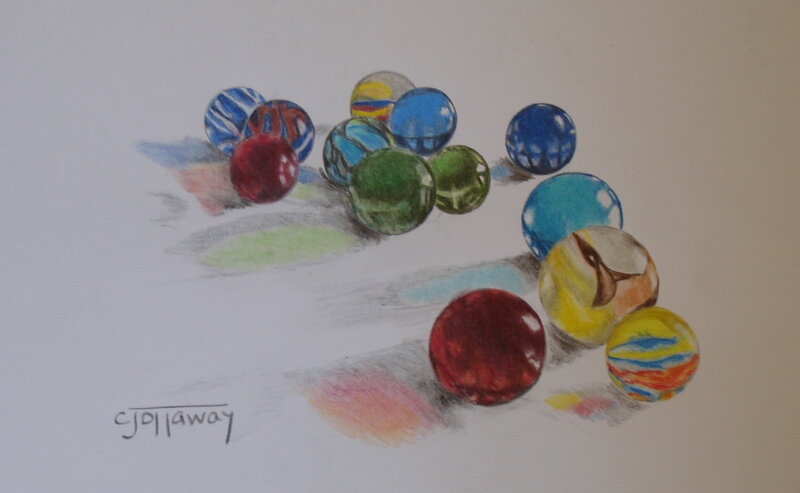 I love how the light pours through the marbles and onto the paper. Wow! I thought it was a photo of marbles. I love your site, Carol.